Ten years ago, we wrote about the emergence of grassroots computing. We were well into an open source, social, web services landscape where the traditional CIO function had perfected generic IT, but was only beginning to empower employees to build the tools that enabled them to execute their area of the business more effectively. The basic idea is that every IT project can’t be custom developed, hosted and supported – it takes too long, costs too much and often has unknown return on investment. The old model of delivery was antiquated and insufficient for a new breed of worker. One of the challenges knowledge workers face is that while they are highly skilled in their domain of expertise they are less skilled at articulating requirements – to be fair, even those in the trade struggle. The challenge of articulating a requirement (not a solution) contributes to slow execution and overall complexity in traditional or modern development – there is no amount of agility that fixes poor requirements management. These facts support the notion that the knowledge worker should be empowered to build technology that supports their execution. Something self-directed, faster and cheaper (reduced localized risk). Over the last decade we have seen higher education continue to shape computer-oriented individuals unprepared for technology professions – certainly a generalized statement, but true more than not. Over 50% of candidates applying for a variety of roles have been recently educated, even certified, in knowledge of specific technologies, but fail the most rudimentary thinking inquiry. They know the mechanics of what they were taught, mostly, but have no concept of what is going on even at a basic level. This widespread “I know how to code” has made mediocre developers look like geniuses. The new breed of worker is one that is unafraid to code but knows not what they do. 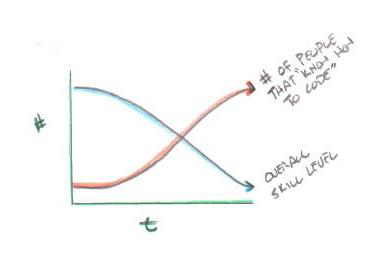 As the number of people that “know how to code” increases the overall skill level decreases and the rarity of true knowledge grows. A shared vision a decade ago was the evolution to a no code platform, one that enabled knowledge workers to build with limited consequence. Willingness, intent and persistence are all the would be needed – forget knowing how to code, let software engineers do that part. Instead, focus on the solution to your problem. Enable reasonably scaled operations and hide all the complexity. Behind the curtain all the complexity that technologists deal with and up front the tools that make it possible to put the power into the hands of the individual. Recently we selected to build an MVP on Bubble which has proved a reasonable rapid development platform. There are plenty of oddities, however if you know what it would take to build this kind of system it is also something to be marveled. The single most noticeable difference between individuals that have been enabled to build using Bubble and those that have built in a more traditional mode is velocity. Someone with enough development and operational experience understands the limitations quickly, can invent solutions to work around those limitations rapidly and has far more clarity in purpose during construction. Bubble makes it possible for people that do not know how to code to build something and makes those with development and operational experience turbo charged. The cyclical rate of change is easily a factor of 100x. Kudos to Bubble for coming as far as they have come. We may be moving into a world with more people that know how to code, using tools, libraries, services they do not fully understand. However, real world experiences building, deploying, scaling, and running code continues along a path of scarcity. If all of those that know keep building the platforms that make it possible for those that don’t know how to build, regardless of the foundation’s robustness, the higher layers will remain fragile and result in eventual wasteland. The pendulum will swing to a point where thousands of applications senselessly littering an organization, triggers the swing back to overly regulated consolidation and efficiency. To have knowledge workers successfully build localized tools without turning everything to junk, they will need to know more about how things work or be doomed to purgatory, neither developer or knowledge worker. The scarier thought is that most leaders are unable to readily differentiate the technical landscape. Add to that company growth, low unemployment and an endless supply of people that “known how to code” signals interesting times ahead.